Have you ever tried to pull a practical joke and have it backfire—on you? Ron telling me the story. So last week, I went looking for the still-standing evidence—all 58 feet of it. Winterville, population 1133, is the smallest city in Clarke County, which is the smallest county in Georgia. And when Clarke County and Athens consolidated in 1991, Winterville said, “No, thanks.” It was and still is happy to do its own thing. And if you haven’t driven around the tiny town lately, you should. Restored historic homes surround manicured green spaces, and civic pride speaks—loudly—without saying a word. Mayberry is fictional, but Winterville is for real. That’s why Ron and his wife, Mary, chose Winterville in the early 1980s, settling on Georgia Avenue, which stretches parallel to Main Street. Before long, Ron was scratching the political itch that runs in his family. Ronald Adams, his late father, was once a state senator and later a state court judge in Brunswick. Ron’s aunt, Mrs. Jean Adams Walker, was married to Randall Walker, who once served as mayor of Jesup. Ron was elected to the Winterville City Council during Mayor Wesley Whitehead’s tenure. “Mayor Whitehead called Councilman Don Bower and me Gold Dust One and Gold Dust Two,” Ron said, when I called him last week. In 1989, Ron resigned from C&S bank in Athens and moved to Glynn County. He needed to be closer to his ailing mother. I met Ron in Brunswick. He was a loan officer at American National bank, and I was on the board of directors. And that’s when I first heard about the Winterville political hijinks. When I told Ron that I had unfurled my 100-foot measuring tape to document the evidence of his gone-awry joke, he started laughing. I laughed listening to him laugh. Here’s how it goes. When the railroad decided to take up the tracks that ran between Main Street and Georgia Avenue, that left a long, grassy stretch on the west side of Winterville. Motorists had to go “too far” to cross over from Main to Georgia and vice versa. The solution was to cut a short street—about midway—to connect the strips of asphalt. And that’s when Ron’s humor kicked in. He recommended to the commission that the 58-foot road be named the Wesley Whitehead International Boulevard. The room erupted in good-natured chuckles. At the next meeting, Ron interjected, “I don’t think we ever recorded the vote on the Wesley Whitehead International Boulevard.” A few more snickers rippled around the table, but no action was taken. Not long thereafter, Ron came home from work and Mary asked, “Did you notice? They put up new street signs today.” Walking outside, Ron saw that the mayor and council had flipped the joke back onto the jokester. 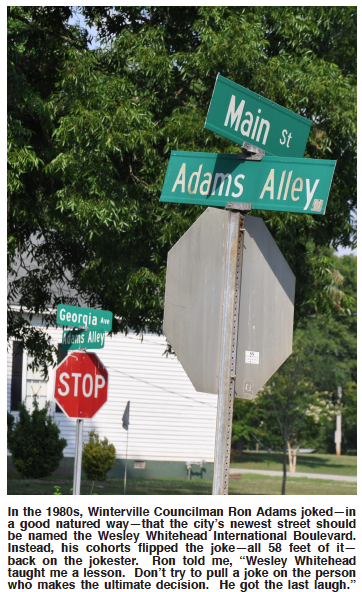 Two green signs—mounted 58-feet apart and atop facing stop signs—read: Adams Alley. Three decades later, Ron Adams, senior vice president at Brunswick’s Ameris Bank, is still laughing about the “honor” of having the shortest street in the smallest town in the smallest county in Georgia named after him. And that’s one more good reason to visit Winterville.